British air traffic controllers have invented a new system that could eventually cut flight delays all over the world. The principle is simple enough. Planes coming into land will be spaced out by time, rather than by distance. But it has taken a team at NATS (formerly National Air Traffic Control Services) four years of scientific study to make sure it is safe, and Heathrow is about to become the first airport on the planet to test it out. It all comes down to wind. Wind is the biggest single cause of landing delays at London's Heathrow airport, messing up flights on around 65 days each year. If airliners are fighting against a headwind, even if they maintain the same speed through the air, they take longer to reach the runway. And that creates delays. Think of it like this. If you're walking the wrong way down an escalator, and the escalator speeds up while you keep walking at the same speed, it takes you longer to reach the bottom. A strong wind acts like a quicker escalator. The new Time-Based Separation (TBS) system simply moves the aircraft closer together, thus cutting those delays. "On windy days we lose around eight aircraft movements an hour - that is every hour through the day," says Paul Haskins from NATS. "With time-based spacing we should see a lot fewer delays and lower holding, and hopefully a far more resilient operation in strong wind conditions." At the moment, air traffic controllers give planes a speed limit as they approach the runway at Heathrow - 160 knots (184mph) from four miles out. It gives pilots time to get set for landing, put the wheels down, arrange the flaps. So if they are going at the same speed, surely they will take the same amount of time to reach the lip of the runway, regardless of the wind? Because aircraft work in three dimensions, they measure their speed through the air, not their speed across the ground. And air moves, in pockets. So when you are flying back across the Atlantic, the speed indicator on the flight deck might be saying 500 knots, but a tailwind could be pushing you at 550 knots over the water. You're flying at 500 knots relative to the air around you, but 550 knots relative to the water. The new system all comes down to vortices. A vortex is a dangerous spiral of air churned up by an aircraft as it cuts through the sky. If you fly through one, pilots can temporarily lose control of the plane. That is why air traffic controllers leave big gaps between flights. With bigger aircraft, like the behemoth Airbus A380, they leave a space of six or seven nautical miles to the next plane. With the relative tiddlers, like the Boeing 737, it's more likely to be three nautical miles. But NATS has worked out that strong headwinds smooth out these dangerous swirls of air much more quickly. So it's actually safe for the aircraft to fly closer together if it's windy. Wind changes all the time. It gusts. That's why sensors on the aircraft are constantly feeding the latest wind information to the ground, to make sure the system is working everything out properly. 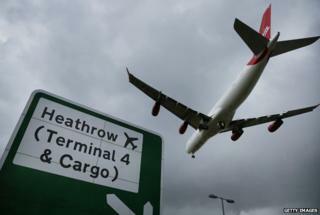 To give an idea of the impact that can have, on a normal day at Heathrow, you'd get around 40-45 landings per hour. At the moment, if it's windy, that might reduce to as little as 32. But with the new system, you can get that rate back up to 40 landings per hour. Heathrow is full. They are not legally allowed to process any more flights per year, having reached their government imposed cap of 480,000 take-offs and landings. It's the main reason they argue that they need a new runway. What it means though is that there is very little wiggle room during the day to squeeze in more flights if they have delays early on. At Gatwick, or any of the other big UK airports, things get quieter after the morning rush hour, which allows them some space to catch-up following any problems. Heathrow doesn't have that kind of slack, which means that they are more likely to cancel flights if, for example, the wind picks up and their hourly landing rate drops-off. Hence, this new system is especially useful for them, and for any other busy airport. NATS wants to sell its new system across the globe. They say there are currently 25 airports that, just like Heathrow, are pushing the limits of their capacity. TBS will mean aircraft flying closer together on windy days. But how much closer? Let's say, on a normal day in normal weather, an Airbus A380 is told to fly six nautical miles away from the next aircraft. It would take the airliner 135 seconds to cover that distance. Now let's say there's a strong headwind. The Airbus would take an additional 25 seconds to cover the same distance. Under the new system, controllers will forget the distance gap, and tell the aircraft to maintain the same time gap, 135 seconds. It puts the planes nearly one nautical mile closer together (5.1nm) but because of the wind, it should be perfectly safe. Despite the four years of scientific testing, some people, possibly even including pilots, might be nervous if they hear that aircraft are flying closer together. To make sure the system was safe, it was exhaustively tested. That meant firing a laser into the air above Heathrow as thousands of aircraft came into land. The equipment measured the size of the vortex and how long it took to lose its sting. Engineers checked 150,000 different flights and that was enough to convince the regulator, the Civil Aviation Authority, to approve the new system. NATS is introducing time-based landings at Heathrow from March this year. By their estimate, it could save an airline £6-7m per annum in lost delays.